If you suffer from headaches, migraines, or jaw pain, a nightguard or mouthguard may be a great solution for you. Never include protected health information in your comments or questions as this is not a secure means of communicating. Please call our office if you need to discuss such information. Protect Your Pearly Whites & Reduce Facial Muscle Pain. Whether your child needs an athletic mouthguard for football season or you’re looking for a way to minimize frequent headaches or jaw pain, Charlotte Progressive Dentistry can help. We create custom-fitted nightguards and mouthguards at our dental facility, providing our clients with superior protection and fit compared to over-the-counter mouthguards. Interested in learning more? Schedule an appointment at our dental facility today. Our Family Dental Services Include Mouthguards! Do you currently suffer from headaches and jaw pain? If so, Drs. Gregory Camp and Susana Junco may recommend wearing a nightguard for people who experience tooth, jaw, or facial muscle pain. This could be caused by the effects of grinding or clenching your teeth. Depending on the symptoms, we may recommend a full coverage appliance or a partial nightguard, called an NTI appliance. A nightguard is used to protect your existing healthy teeth. It is a clear, custom-made, and thin removable device worn on your upper or lower teeth as you sleep. Studies suggest those who grind and clench their teeth may experience up to 80 times the normal tooth wear per day compared to those who do not. By wearing this nightguard, you protect from enamel loss and reduce the need for crowns and dental extractions in the future. Sports mouthguards are highly recommended for both professional, amateur, and student-athletes because they offer the greatest amount of protection for your mouth and teeth. When worn correctly, they can protect against dental trauma, including teeth fractures and soft tissue lacerations. 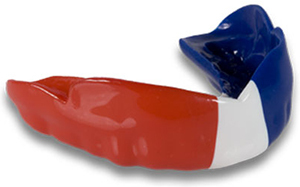 Here at Charlotte Progressive Dentistry, we can make a custom-fitted sports mouthguard that provides superior protection and fit compared to over the counter “boil and bite” mouthguards. We can even customize the mouthguards to a variety of colors and team logos to fit the personality of all athletes and sports fans!